4 Time Zones, 2 Bucket List Items, 1 Month. What a month March has been. I’ve travelled along the mountains, rivers and rice paddies of Thailand’s north, revisited with much nostalgia the familiar streets of Singapore, revelled in the festivities of Las Fallas in Spain, and finally made that illusive trip to India’s northeast to live with the Mishing tribe of Assam and explore the wilderness of the eastern Himalayas. And in the midst of all these adventures, I’ve been overwhelmed to see my travel story about Turkey’s Black Sea region, published in BBC Travel, a travel publication I’ve always held in such high regard. March started with a trip to the northern tip of Thailand, where we stayed in a village home stay with a Thai-Dutch family on their rice paddies. Our days were spent strolling along the Kok river, hiking in the mountains beyond, and indulging in the most delicious home-cooked Thai food. Starting the day on the rice paddies of Chiang Rai. Strolling along Kok River in Chiang Rai. The rice paddies of Chiang Rai, in the backdrop of gentle hills. Our cosy hideout at Bamboo Hideaway in Koh Mak. At an isolated beach on Koh Mak island. Only 3 dogs for company on this Koh Mak beach! I made a nostalgia-filled trip back to Singapore, on invitation from the Singapore Tourism Board. Although I’ve studied and worked in the country for half a dozen years, it was the first time I saw it from the lens of a traveller (and realised just how expensive it can be compared to its neighbours; see my list of the best free things to do in Singapore). I discovered just how quaint the shophouses and by-lanes of Chinatown are, sampled chic new cafes and concept bars that have popped up along what were once unassuming neighbourhoods, revisited some of my favourite vegetarian eateries, and in a way, found closure in my decision to move back to India! Stunning early morning landing in sunny Singapore. The Supertrees at Gardens by the Bay. The skypark at Marina Bay Sands. The high life at Singapore Turf Club! Walking along the quaint streets of Chinatown. I spent an entire month exploring Barcelona, Ibiza and the Andalusian countryside of Spain last autumn, but jumped at the chance to revisit Spain on a second invitation from their Tourism Office. Unlike Barcelona, it was almost love at first sight with Madrid; the charming architecture, the friendly locals, the gorgeous riverside walks, and a hint of spring everywhere. In Valencia, I revelled with the locals in the festivities of Las Fallas. The city felt like Disneyland, with colourful Fallas adorning the city, fireworks in every neighbourhood, street parades with women and men dressed in their traditional costumes, and chocolate con churros for sale everywhere! On the last day of the festival, all the Fallas were burnt (a little like Dussehra) in one grand show, and the entire city seemed to rise up in smoke. I managed a quick detour to Albufera, in south Valencia, to hike along countryside farms and lakes, in the backdrop of mountains. Along the gorgeous river of Madrid. Fallas (installations of paper mache) on display during the Las Fallas. Such quirky Fallas were put up by every neighborhood in Valencia. Having beer at a secluded beach, at Albufera in south Valencia. A second item off my bucket list for 2013 (the first was revisiting Southeast Asia), I finally made that illusive trip to the first of the seven sisters. Guwahati felt something like India in the 90s; chaotic and in transition. But I fell head over heels in love with Majuli, the largest river island in Bhramaputra, and possibly in the world. 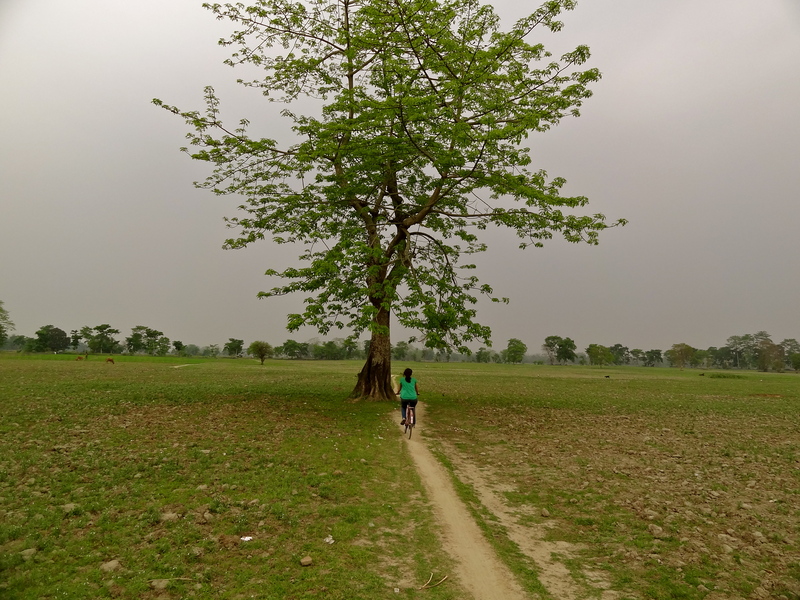 Majuli was surreal, almost other worldly – there were rolling meadows everywhere, sleepy riverside villages, and more cattle grazing on the endless pastures than people on the island. These were landscapes I’ve imagined New Zealand to have! At the cosy Le Maison de Ananda on Majuli Island. Bliss is cycling around Majuli island. Sunset over the dry river bed of the Bhramaputra, at Majuli island. Cycling over rickety bamboo bridges in Majuli. River crossing for people, bicycles and motorbikes – on two boats joined by wooden planks! A gorgeous sunset on Majuli island. Tea pluckers along the tea country of Assam. Which of these places would you most like to visit, or read about? Join The Shooting Star on Facebook or Twitter for travel stories from around the world. I like the focus on NE India. Have heard so many stories of even the far off places in NE. Awesome post & photographs.Thanks a lot for sharing beautiful photographs from Assam. So many more to share! I can’t wait to. road trip- around Manebhanjan and Peddong from siliguri – sounds great no? Im excited, hope this works out!! Aside, I saw untravalledindia featured in yourstory.in, was wanting to fwd you but missed. Probably you would know. Could you tell, which place exactly in North Thailand you stayed? If possible the home stay, name as well. Previous PostBoutique Hotels in Singapore Under US$ 150. Next PostTe Quiero Madrid: A Photo Essay.